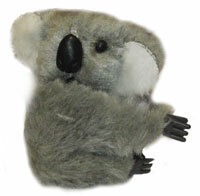 The tight grip of these cute, koala soft toys can make a eucalyptus branch of anything they clip on to, be it a pen, pencil, laptop, or a loved one. The koala has long been an icon of its native Australia, so why not adorn your home or office space with an army of these drowsy, tree-dwelling marsupials? I would really like to get one of these Koala's - they look like the retro 80s Koala clips and would be perfect for my 80s outfit!